Denon D-M40DAB review | What Hi-Fi? It is difficult to be over complimentary about the D-M40 as a micro hi-fi system at this price; Denon has produced something even better than last year’s Award winner. It isn’t often hi-fi equipment brings to mind Fyodor Dostoyevsky. Moreover, to compare Denon’s D-M40DAB micro system and its predecessor, the D-M39DAB, to the Russian’s novella The Double would be somewhat crass. Still, we are. Because, basically, the two systems look the same but their sounds are really quite different. We say they look the same, but there have been subtle changes throughout, ranging from the incidental (the remote control now has a matt finish) to the rather more effective. First things first: you won’t struggle setting this up – everything you need is in the box, including speaker cable, and all you have to do is plug it in – but it is worth taking a little care over placement. This isn’t a system for expensive equipment supports, but we tried a couple of tables and a bookshelf to see what it would do to the balance (we preferred the latter, if you’re interested). If you’re looking for a system to fill a certain space, you can always fiddle with the EQ settings; you may just need to experiment a little to arrive at the sound we’re about to describe. In short, it is impressive. We load the CD of Bill Wells and Aidan Moffat’s album Everything’s Getting Older and are struck by the improvement on the Denon D-M39 – our 2014 Award-winner in this bracket. There is more detail, most noticeably in the midrange and bass, better organisation and more confidence and space in the treble. Moffat’s vocals on Let’s Stop Here feel more alive. Plugging an iPod into the front-panel USB input (which now accepts AAC, WAV and FLAC, as well as the WMA and MP3 of its predecessor) we play Death From Above 1979’s Turn It Out to much the same effect. A relatively rough-and-ready recording with heaps of bass and crashing cymbals each setting their own perennially changing rhythms – there’s a lot of potential for any system to get this wrong. Yet the D-M40 spits it out with ease. It finds that balance between weight, detail and attack in the bass, while timing so well you’re almost terrified into moving your feet. So what has Denon actually done to achieve this? There’s an improved 192kHz/32 bit digital-to-analogue converter, for a start, and a more sensitive DAB and FM tuner, too, feeding a pair of upgraded speakers. Take off their front grilles and you’ll find a new dust-cap on the bass and midrange driver, designed to smooth the peak at high frequencies, and inside there are further build and motor-system changes for more precise piston movement with less distortion. Small engineering modifications in the tweeter make it more precise too, and new gold-plated speaker terminals on the main unit mean they won’t deteriorate. 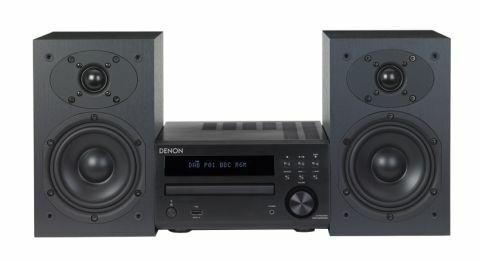 The thought Denon has put into improving an award-winning product is evident. In its usability, there are obvious things, such as the second optical input (for TV and whatnot) and new three-way gain control in the headphone amp. There are subtler ones too, such as the new finish and marginal increase in size of the volume knob making it that little bit easier to turn, that new finish on the remote not showing up so many grubby mitt marks. It all counts. All this micro system is lacking is Bluetooth or wireless capability, which is provided by many of its competitors at this price. Otherwise, we really can’t find a bad thing to say about the D-M40; the sound is well balanced, detailed and full of character, with the speakers and CD-receiver – which you can buy separately for £250 – finely matched. We experimented by swapping the speakers for a pair of Q Acoustics 3010 (£140), and wouldn’t be able to justify the extra outlay. If it’s this kind of thing you want, we wouldn’t hesitate.